This is a spider photo, which I actually took at Singapore Zoo. The novel feature I guess of this photo, is I didn’t have a proper macro lens to make the shot. So this is using a combination of a 70-200/4 lens and a achromatic diopter, with of course, a flash. In effect, I’m having to improvise. Which is a common issue with travel photography. 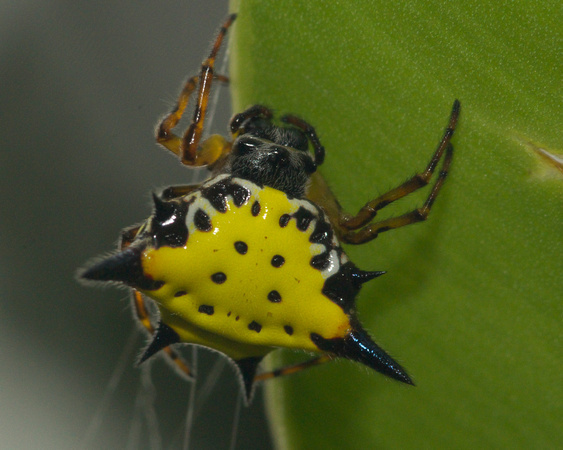 It is a female and an orbweb spider. The colours and spikes actually make for quite good camouflage. Hi- well, I don’t think there are any bad spiders. But if you mean is it venomous to people, no. It’s an orbweb. The family is pretty harmless (and the fangs a bit too small) to really cause any concern.